As far as I know, GoPro is first action camera brand to make it big, and they are the flagship brand for the segment. The GoPro HERO line of cameras are used to make all those cool extreme sports videos that we see on the internet these days, and the HERO6 is the newest iteration of the product. Priced at $499 USD (at the time), the HERO6 is definitely a premium product. If I had to spend my own money, I wouldn’t be able to justify spending $500 on an action cam that I’ll use a couple times a year at most. Luckily though, I didn’t have to: I won the camera from an online sweepstakes. This is probably the most valuable prize I’ve won so far. 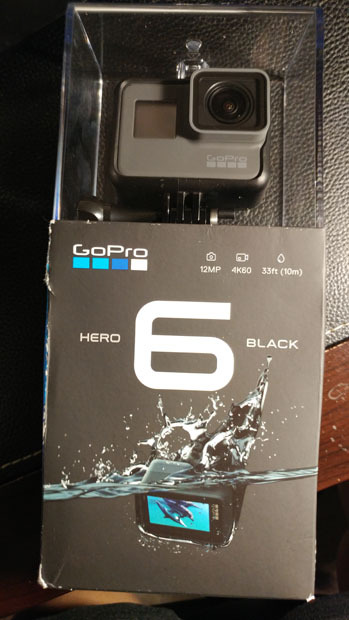 Looking at the product, the HERO6 comes in a packaging that shows off the entire camera in a display case. All the accessories are in the box underneath. The package contains two sticky mount pads, one mount, and a USB-C cable for charging and data. The HERO6 itself has the classic shape of the HERO line of cameras and is colored dark gray. Some of the feature highlights is that it has a wide-angle lens, is waterproof up to 33ft (10m) without additional protection, and can shooting 1080p video at up to 240 fps or 4K video at 60 fps. The specifications are impressive for something with such a small form factor. 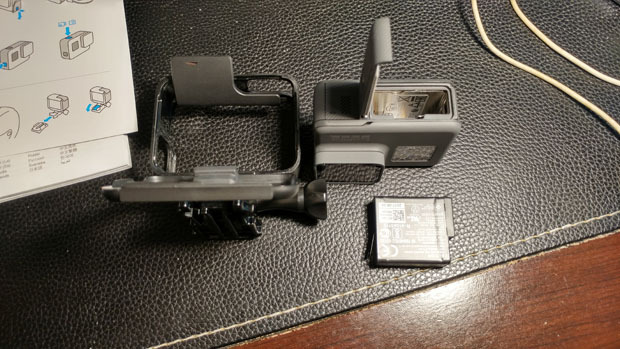 The HERO6 with its case and battery. From the software side, the HERO6 can be controlled using a smartphone using the GoPRO app. 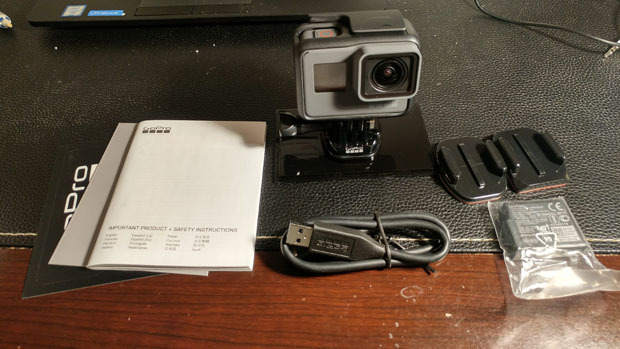 All one needs to do is to pair the GoPro and the phone via Bluetooth and/or Wi-fi. 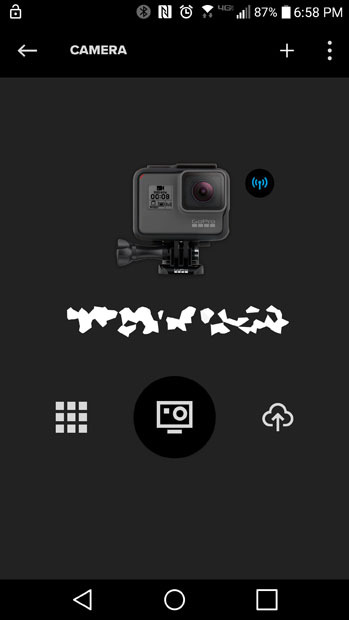 The app allows for viewing and controlling the HERO6 using the larger screen of your smartphone. It’s not necessary to make the HERO6 work, but it’s a neat ability. Given this is an action cam, I just had to take it out for a spin. 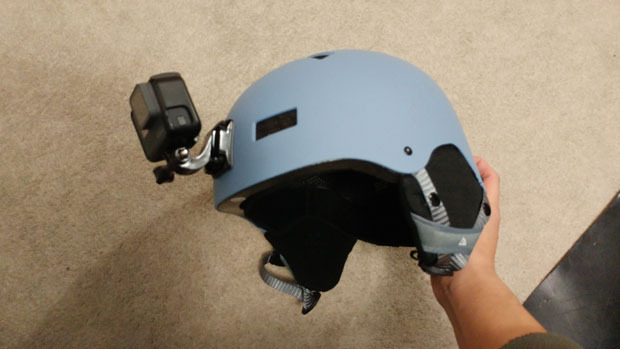 GoPros are all about the accessories, so spent 20 bucks buying an accessory kit with a whole bunch of pads and mounts, which allowed me to mount my HERO6 to the front of my skiing helmet. 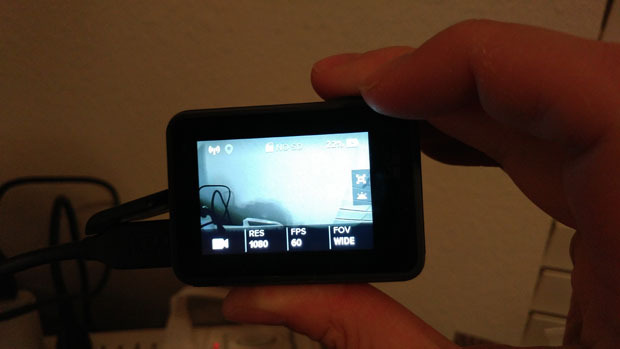 I mounted it on the front as to have the option of bending the camera down to record my face. Not sure how useful that’d be, but having the option is fun. With everything ready to go, I used the HERO6 while skiing at Cypress Mountain, and a 30 second clip of the helmet-mounted footage, shot at 1080p at 60 fps. The video looks pretty good, and the digital image stabilization seems to work pretty well despite me looking in different directions. I did run into some problems with the HERO6 during my ski outing though. There was a time where the camera froze and I had to take out the battery to restart the camera. Also, the three clips that I ended up recording could not be played back on the HERO6 itself or GoPro smartphone app, but the video file played perfectly fine on my laptop. I did fall a few times while skiing, and maybe I fell hard enough to jar the camera. Overall the performance was a mixed-bag: the video was great when the camera worked, but there were certainly issues. At this point, the HERO6 is a nice gadget that I’ll probably use when I go skiing, kayaking, rafting or other fun outdoor activities. Hopefully the issues I saw during my ski trip were isolated incidents.